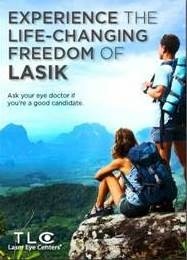 (1) AM I A GOOD CANDIDATE FOR LASIK? The best way for you to determine this is with a thorough exam from your eye doctor. Appropriate candidates must be at least 18 years old, in good general health, and have good eye health with no diseases such as cataracts or glaucoma. Laser vision correction can treat a very broad range of nearsightedness, farsightedness and astigmatism. Through an initial consultation with your eye doctor or at the nearest TLC Center, your doctor will confirm if you are a good candidate, explain the procedure, and answer your questions so that you can make an informed decision. He or she will explain what results you can reasonably expect by measuring your prescription and thoroughly examining your eyes. TLC Laser Eye Centers has a consistent record of doing what is best for the patient. In fact, many people choose TLC based upon our reputation for excellent patient care. (3) WHAT IS THE DIFFERENCE BETWEEN CONVENTIONAL LASIK AND CUSTOM LASIK? CustomLASIK uses a tool called the wavefront analyzer to accurately measure the way light travels through your eye. The resulting map of your eye is then programmed into the laser, and the laser treats your eye based upon that personalized 3D map. CustomLASIK helps to treat ?higher order? aberrations, which are tiny imperfections in the eye that can have a significant impact on one's quality of vision. In fact, higher order aberrations have been linked to visual glare and halos. Higher order aberrations have not been previously treatable with contacts, glasses or Conventional LASIK. Conventional LASIK is still a very good choice for many patients, though most will prefer the higher level of customization that CustomLASIK can provide. Ultimately, you need to discuss the options with your doctor. You can trust your TLC-affiliated eye care professional to help you make the correct decision. (4) IS THE ACTUAL LASIK PART PERFORMED THE SAME WAY? OR IS CUSTOMLASIK A COMPLETELY DIFFERENT PROCEDURE? The actual LASIK procedure is performed in exactly the same way in both Conventional LASIK and CustomLASIK. The pre-op testing for Conventional LASIK and CustomLASIK differ greatly. The wavefront analyzer used with CustomLASIK brings a whole new level of knowledge and accuracy to the surgeon. While laser vision correction has proven overwhelmingly successful in reducing dependence on glasses and contact lenses, the degree of improvement may vary among individuals. How well and how quickly your vision improves depends on how well you heal and the severity of your prescription. Although TLC cannot promise patients "perfect" or 20/20 vision, most laser patients with mild to moderate prescriptions do achieve 20/20 vision or are within 1 to 2 lines of 20/20 vision on an eye chart. This means they no longer need glasses or contacts to drive, play sports, watch movies and TV, or participate in careers requiring excellent vision such as police and fire departments. Additionally, CustomLASIK has proven to be an exciting development. Clinical studies have shown that CustomLASIK can improve not only what you can see but how well you can see it. In the past, all vision was measured using a standard vision chart. If you could see the letters, the doctor would proclaim your vision as a number, such as 20/20, 20/100, etc. But now, with CustomLASIK, doctors are able to focus on the quantity and quality of your vision. Many patients who have had CustomLASIK are reporting being able to see clearer than ever before. It's as if someone had taken an ink pad and freshly stamped each letter on the vision chart in bold black letters. Because CustomLASIK corrects the unique imperfections in each individual's vision, it is likely that night vision will be improved. Your pre-procedure consultation with your doctor will help determine the range of your probable outcome based on your particular prescription, healing profile and expectations. The results and research gained from tens of thousands of procedures performed through TLC are shared throughout our network, allowing doctors to continually fine-tune techniques, more effectively forecast visual results, and counsel new patients. Keep in mind, as a patient ages the need for reading glasses is quite common. TLC stands behind its patients' distance vision results for life because we have confidence in the stability of results over the long-term. The TLC Lifetime CommitmentSM program ensures free enhancement procedures for life for qualified nearsighted patients ? and this commitment will be honored by any TLC location in North America. Be sure to ask your local TLC location for important details about this program. *(5) I'VE HEARD A LOT OF GREAT THINGS ABOUT LASIK. WHAT CAN LASIK DO FOR ME? (6) HOW WILL I KNOW WHAT PROCEDURE IS RIGHT FOR ME? Your eye care professional is the best person to tell you that. CustomLASIK is necessary for some and desirable for many. Everyone's eyes are different and your eyes may best be treated with CustomLASIK. You should schedule a consultation with your eye doctor. Together, you can determine what is right for you. What does LASIK cost? Is there a price difference between Conventional and CustomLASIK? TLC has locations in the U.S. and in Canada. The price of the procedure is determined by the level of refractive correction required, the laser technology recommended for your specific condition, and the center location. For information on pricing, call 1-888-CALL-TLC. The cost of CustomLASIK is generally greater than the cost of Conventional LASIK. CustomLASIK is performed using some of the most advanced technology in the vision industry. The procedure combines the technology of the wavefront analyzer with the precision of a computerized laser and the skill of your respected surgeon. (7) WHO WILL MY DOCTORS BE AND WHAT WILL THEY DO? Doctors are involved in all three phases of your laser vision correction procedure: the pre-procedure consultation, the laser procedure, and post-procedure care. Two doctors are involved in the overall procedure: the TLC affiliated doctor who performs the procedure itself at the TLC center, and your own eye doctor who can provide your pre- and post-operative care (if you do not currently have an eye doctor, your pre and post- operative care can also be provided at TLC). All doctors working with TLC, including your own eye doctor, have been educated in all aspects of laser vision correction. Although TLC affiliated surgeons are renowned for their training and expertise, the outcome of your laser procedure also depends upon the right care before and after your surgery. We recommend you consult with your own eye doctor who is more familiar with your eyes, your history, and will continue to care for you years after your procedure. If you don't have an eye doctor who can help, we'll provide you with one. We will work very closely with your eye doctor to provide you with a high level of care and results. (8) WHAT DO I NEED TO KNOW ABOUT THE DIFFERENT LASER TECHNOLOGIES? TLC, through our network of more than 70 centers, has access to the latest laser technologies including eye trackers and scanning lasers. All TLC centers in the United States use only FDA-approved lasers to gently reshape the cornea during LASIK. These excimer lasers use cool, computer-controlled beams of ultra-violet light. The best technology and laser for you is determined during the personal TLC consultation and is dependent on such things as prescription, thickness of the cornea, size of the pupil and ocular anatomy. (9) WILL THE PROCEDURE HURT? Most patients find the procedure to be slightly uncomfortable. One good way to learn more about how it might feel is to talk to someone who has had the procedure, such as a friend or relative, or a staff member at the doctor's office. For most patients, the feeling of anxiety and the fear of the unknown is worse than the actual procedure. Anesthetic drops are used to numb the eye just before surgery begins and you may be given a mild sedative. After your procedure, your eye may feel a foreign body sensation or irritation for a few hours, but most patients are quite comfortable after taking a short nap. You will be given drops for your eyes to counteract the potential dryness you may experience for several days following the surgery. (10) WHAT WILL MY RECOVERY BE LIKE? Most LASIK patients usually see quite well the day following their procedure and may be able to resume most of their normal daily activities, but patients with higher prescriptions may recover more slowly. Although the speed of visual recovery depends on personal healing patterns, most patients notice dramatic visual results within the first few days following their procedure. (11) WHAT ARE THE RISKS? There are risks with the laser vision correction procedure. However, the chance of having a vision reducing complication has been documented in a number of clinical studies to be minimal. Remember, millions of people have had excellent results from laser vision correction. Some potential complications include conditions such as dryness, complications in making the surgical flap, night glare, under or over-correction, and loss of best-corrected vision. At TLC Laser Eye Centers, these and other risks of the surgery are discussed fully with the patient prior to the procedure. Proper preoperative screening ensures that we proceed with the procedure only when it is medically advisable. As well, diligent post-operative care helps to identify and address any potential healing complications. Perhaps the best way to help prevent LASIK complications is to choose a surgeon who is experienced and respected in the community. This is one of the advantages of choosing TLC. TLC is careful to join only with respected and knowledgeable eye care professionals who value patient care above all things. TLC Laser Eye Centers strives to make LASIK affordable for every patient. With a variety of ways to pay, there should be nothing standing between you and some of the most experienced LASIK surgeons in the country. Vision benefits vary from one health insurance plan to the next. Some plans may have an arrangement with TLC Laser Eye Centers that could substantially reduce your cost for laser vision correction. A TLC representative will be happy to work with you personally to determine how your plan may help you and how much you may save. Many employers offer flexible spending accounts (also called a flexible benefits program) to help offset medical expenses. Flexible spending accounts may allow you to set aside pre-tax dollars for certain medical costs, including procedures like LASIK. Ask your employer about deducting pre-tax dollars from your paycheck to realize savings on your laser vision correction. TLC Laser Eye Centers offer several payment plans to help make laser vision correction affordable for almost everyone. Credit lines with flexible terms may be available to cover the cost of the procedure. This easy finance plan allows you to customize your loan by selecting the amount you need and your repayment terms. When you apply for financing, you usually have a decision in a matter of minutes. In Step One, your doctor creates a micro-thin flap of tissue on the outer layer of your eye, also known as the cornea. The flap is important for rapid healing, greater comfort and better vision. If it is too thick, too thin, or irregular, it could affect the quality of your vision. Although complications with LASIK surgery are rare, when they do occur, they are often associated with the use of a hand-held microkeratome blade in Step One. IntraLase makes LASIK surgery better by replacing your doctor?s hand-held microkeratome blade with a computer-guided laser that delivers micron-level accuracy over 100 percent greater than a microkeratome. * This gives you the greater assurance you need that Step One of LASIK eye surgery will be accurate, safe and a first step towards giving you the best LASIK result possible. In Step Two, your doctor folds open the flap so that an excimer laser can be used on the inner cornea to correct your vision. Your flap is then returned to its original position where it seals without stitches. Step One is important to faster healing, greater comfort and better vision. The INTRALASE laser is a more precise and safer method for creating the flap in Step One and is an essential component to making both standard and custom LASIK surgeries better.